Flattr is a social micropayments system that allows you to translate your appreciation for online content – be that a blog post, a video, a song, a piece of software – into cash: making it as easy to pay a small sum to digital content makers as it is to ‘like’, ‘favourite’ or ‘star’ their output. Flattr’s users decide a monthly budget (the minimum is just €2), with each piece of creative content you ‘like’, ‘star’ or ‘favourite’ that month automatically getting an equal split of your pre-set monthly total. 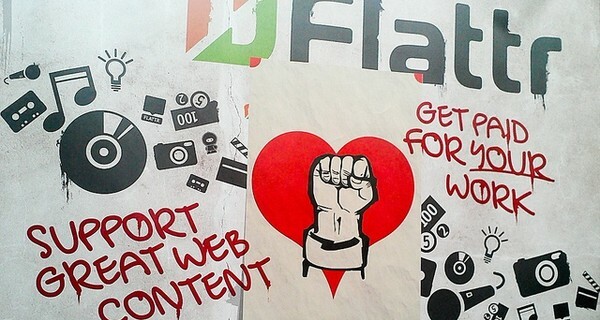 Content creators receive 90% of money given, and if they haven’t joined Flattr yet the micropayment for their content is carried forward and split with other creators you’ve ‘liked’ in whichever month they do sign up. The tool was released in March 2013, and works with Instagram, Soundcloud, Github, Flickr, Vimeo, 500px, App.net – not however with the microblogging site Twitter, which has barred it saying it violates its API terms. It uses the Euro as a base currency, and accepts Paypal, plus most local and international credit and debit cards. The site, like Kickstarter, lets you donate anything from a few pennies to really big sums. However, whereas Kickstarter lets you contribute funds towards something that has not yet been made, Flattr instead pays someone for content that you’ve already consumed. Sunde is optimistic people will pay for something they could watch for free, ‘I started Flattr to give everyone a completely equal chance to make money on the content they make,’ he says. ‘Without coercion, censorship or locking up the information. Flattr encourages the sharing of information and money. This is how the Internet works.’ The jury’s out but watch this space.